Can not say enough good things about this experience...only con it was short. Next time definitely wanna do more nights. Disney does vacation well. We felt the service was off the charts. Placed a deposit for another cruise...got some very good perks for doing this. 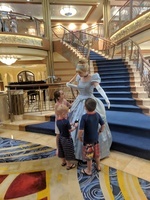 My kids loved this trip. The food was amazing especially for vegetarians...I had so many options it was hard to choose. Castaway Cay was the best. The day was fun and relaxing. The pools do get a little crowded but we never had a problem getting a spot. I would recommend bringing something to entertain the children at the Port while waiting to board..also a snack. Everyone on the ship is super helpful so no need to stress about not knowing where to be. The kids team was great and really made my shy children feel welcome. There is so much to do on board. I recommend taking the time to do the mid ship detective agency all three of my kids loved it. Can not say enough good things about this experience...only con it was short. Next time definitely wanna do more nights. Disney does vacation well. We felt the service was off the charts. Placed a deposit for another cruise...got some very good perks for doing this. 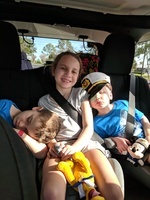 My kids loved this trip. The food was amazing especially for vegetarians...I had so many options it was hard to choose. 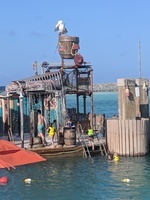 Castaway Cay was the best. The day was fun and relaxing. The pools do get a little crowded but we never had a problem getting a spot. I would recommend bringing something to entertain the children at the Port while waiting to board..also a snack. Everyone on the ship is super helpful so no need to stress about not knowing where to be. The kids team was great and really made my shy children feel welcome. There is so much to do on board. I recommend taking the time to do the mid ship detective agency all three of my kids loved it.